As much as I love a good pie, more often I opt to make a galette, which is a free-form tart. It's a snap to throw together and I prefer the galette's crust-to-filling ratio: lessing filling, plenty of crust. The recipe for the galette dough is from Chez Panisse Fruit and makes enough dough for two tarts, so you can either double the filling and make two tarts or freeze half the dough for a second tart later. The apple filling is adapted from the same book. Make the dough: In a large bowl, stir together flour, sugar, and salt. Using your hands, rub a third of the butter into the flour, until the mixture resembles coarse cornmeal. Cut the remaining butter in with either your fingers or a pastry blender, leaving these pieces larger, about the size of peas. Drizzle ice water over the flour-butter mixture in stages, about a third at a time, mixing the dough with your fingers and gently pressing it together. If there is still a lot of flour in the bottom of the bowl, add a little more ice water. Once the dough has come together, press it into a loose ball. Divide the ball in half, wrap in plastic wrap, and press each ball into a disk. Refrigerate at least 30 minutes before rolling out the dough for the galette. In a small bowl, mix together the sugar and orange zest and set aside. Make the galette: On a lightly floured surface, roll out one of the dough disks into a 12- to 14-inch circle, about ⅛ inch thick. Brush excess flour off both sides of the dough and transfer the pastry to a parchment-lined baking sheet. Arrange the apple slices on the dough, leaving a ¾- to 1-inch margin on the outside. Fold the overhanging dough over the fruit, at 1- to 2-inch intervals, pressing the dough gently into itself. Brush the apples and dough with melted butter, if using, then sprinkle with the orange sugar. Bake in the center of preheated oven for 40 to 45 minutes, rotating the tart after 20 minutes to ensure even browning of the crust. 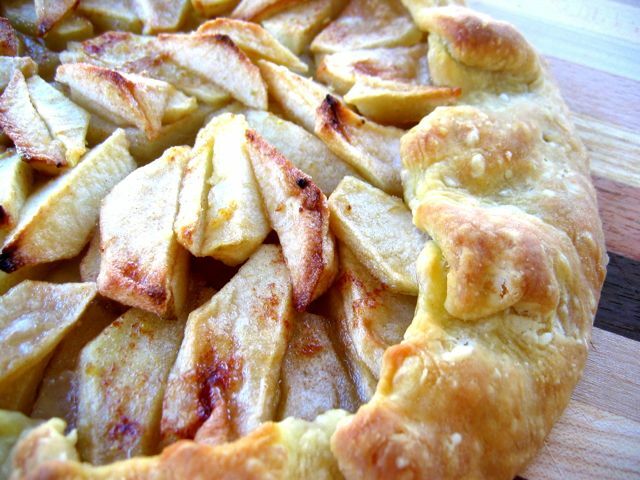 When the galette is done, the apples will be soft when pricked with the end of a paring knife and the crust will be a rich, golden brown. Cool on a rack for 15 minutes before serving. Serve warm with lightly sweetened whipped cream or vanilla ice cream. You can use any kind of fruit that's solid enough to hold its shape while baking: pears, plums, peaches, etc.